One of the key features of Aframe is the ability it gives content producers to share what they&apos;re working on for review and approval with anyone in the world, Aframe makes this possible. We will now look at all the different options. Note: if you are looking for extra protection on your links, look out below for the &apos;**Require Login**&apos; option, where you can require the recipient to view the material but only after signing up, using the exact email address you sent it to. This means that you know exactly where the content was sent and who has watched it. First, give your shared link a title. Next, choose exactly what you&apos;d like the recipient to have access to. By default, the Web stream is marked, but we can also choose whether we’d like the recipient to have download access to the h264 proxy, original file and any additional transcode flavours you have on your project . Checking these boxes means that whoever receives the link will be able to review the content online before choosing whether or not to download the high res original or compressed proxy. There&apos;s also the option to give your Shared link an expiry date. 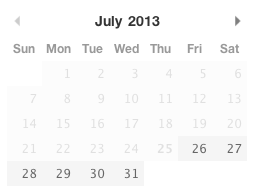 Clicking on this field will open a calendar view, where you can select the date you&apos;d like your page to expire. The Shared link will expire at 23:59 on your chosen date and is relative to the the timezone in which it was created. 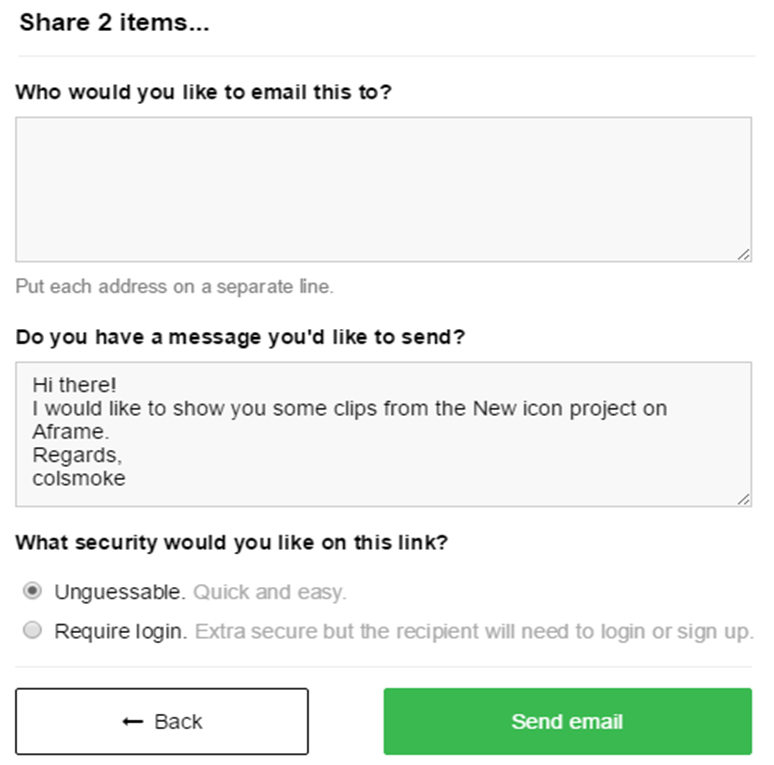 Choosing &apos;Create and email&apos; will mean that Aframe will deliver the link to your chosen recipients. Selecting this option will bring up a window (as shown below) with additional options, where you add your recipients email addresses, add a message and choose the security. Once you select &apos;Send email&apos;, Aframe will deliver your link to your chosen recipients. In the &apos;Who would you like to email this to?&apos;, you can past an email distribution list but make sure that each address is on a separate line. You can personalise a message to be sent in the next text box and then we move onto the security level of your link. 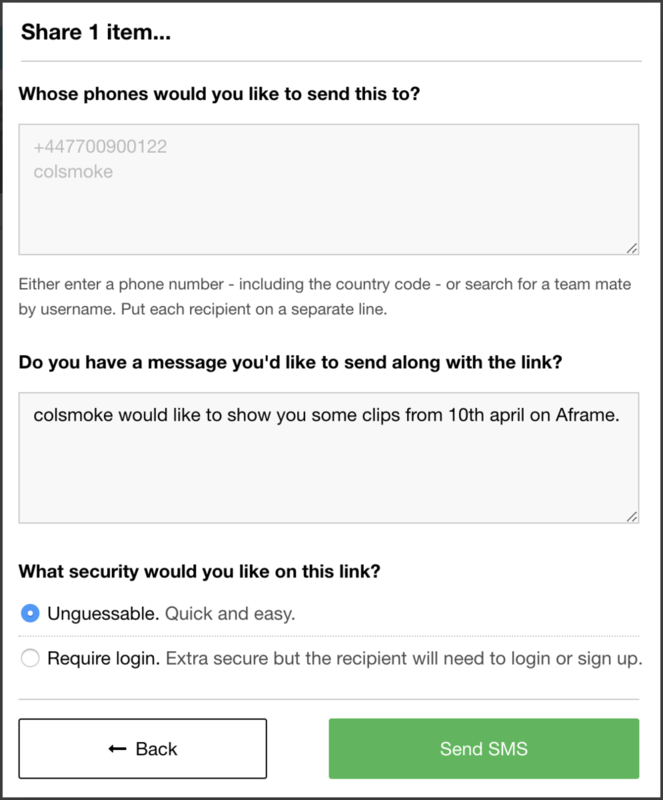 &apos;Unguessable&apos; - This enables the recipient to see your footage quickly and securely, with the access to the content limited to only those who know the URL. &apos;Require Login&apos; - For an extra layer of security, you can stipulate that the link should only be view-able by a user on Aframe with a registered an email address. This option is a bit more fiddly for the person receiving your shared link, as they&apos;ll have to sign-up for an account and confirm their email address. It&apos;s entirely down to you and your needs. It’s basically a pared-down version of Aframe, displaying the selected content without any of the controls afforded to team-members. Viewers are able to playback the video, skip around the selection, go full-screen... everything you would expect from a piece of embedded online moving image. Note the playlist on the right-hand side of the screen, which enables the user to jump from clip to clip. Clips in a selection will play back one after the other (the order can be determined at time of creating the link using the &apos;order&apos; filter. &apos;Require Login&apos; - For an extra layer of security, you can stipulate that the link should only be view-able by a user on Aframe with a confirmed contact number. This option is a bit more fiddly for the person receiving your shared link, as they&apos;ll have to sign-up for an account and confirm their contact number. The confirming of their contact number is done via a code sent from Aframe, normally during account registration but can also be done in their user profile. Quick, simple, anyone with the link can view and no registration required = &apos;Unguessable&apos; option. Extra security and only the person who you have sent it to allowed to access but requires Aframe registration and confirmation = &apos;Require login&apos; option. In the &apos;Who&apos;s phones would you like to send this to&apos; text box, you can add the phone numbers, including the international number sign of + or 00, then country code and number (losing any initial zero in the mobile/cell contact number) or the username of someone that is on the same project. An example being a UK number of 01111111111 would become (UK international dialling code is 44) +441111111111 or 00441111111111. You need to add each number on a separate line. Note: Project team members must have their contact number added to their user profile for us to be able to send to them using their username. If you add their username and they do not have a number, you will see an error at sending. You can send to anyone regardless by adding their mobile number to the recipient list instead of username, they will need to confirm their contact number before they can view links. Note: Unguessable & Require login options can be removed as an ability at Account/Organisation/Project level by an administrator. In abilities, disable the &apos;Users can share clips as unguessable links&apos; option or &apos;Users can share clips with logged-in users&apos;. If you do not see the require login option when creating the shared link, this option may have been disabled by an organisation administrator. 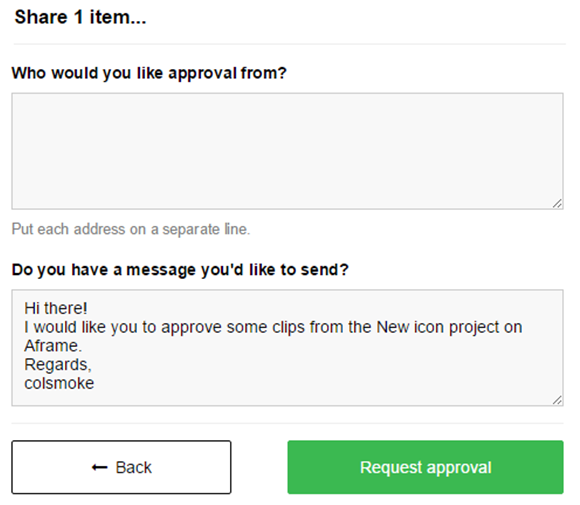 Choosing the option of &apos;Create link and request approval&apos; will give the recipient the extra ability to approve or reject the footage and leave comments if needed in either case. The layout looks slightly different as we can see below. This option has the same security of &apos;Require login&apos;, in that the recipient can only access the link by signing in to Aframe using the email address the link is sent to. The recipient with receive an email from Aframe, which contains a link and if selected, they will be taken to the Aframe sign up screen, unless already logged in, where they can either login as normal or sign up for a free Aframe user account. 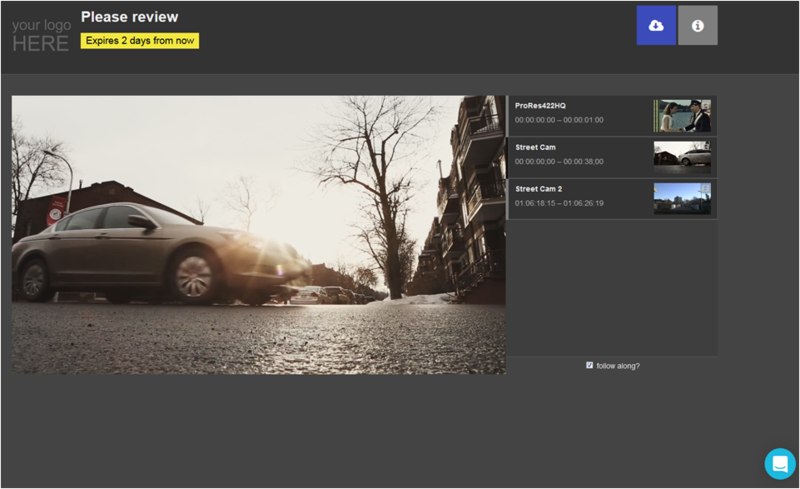 The recipient can now watch the clip, download it (if the option was granted) and also approve or reject the footage. once they select Approve or Reject, they will faced with either of the below. You can see above that you can get a snapshot of what has been sent, actioned, approved, created and even views. Click on its title to view it or select the red &apos;minus&apos; button to immediately expire the link, great if any links have been sent in error. 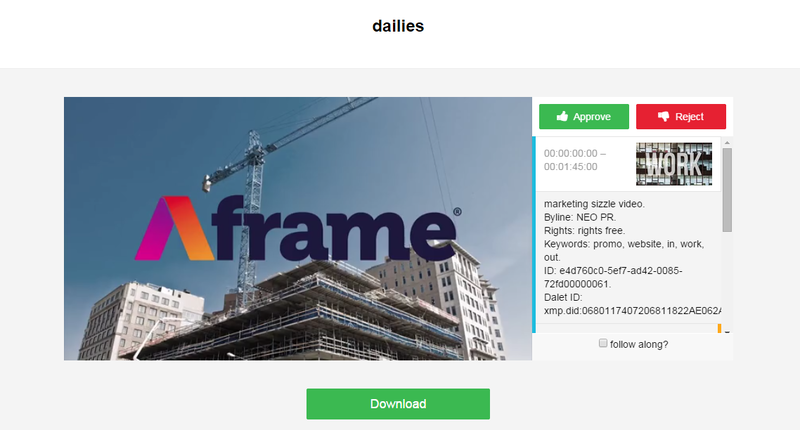 Back in your main Footage section of Aframe will you will see Review and Approval filters in the bottom right of the screen, as pointed out below. 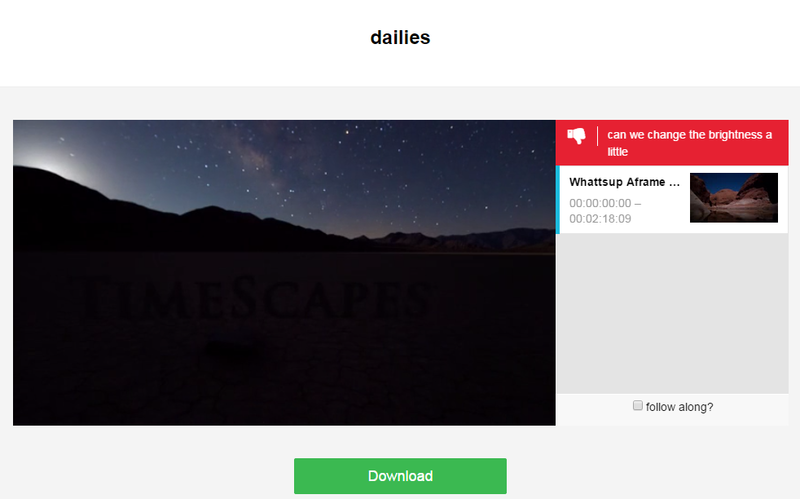 Here you can quickly filter the clips down to only show approved, rejected or pending. Here you can see who approved, rejected and their comments. As you can see, this feature means that wherever you are, whatever you&apos;re working on, you can share, review and seek approval on content with anybody in the world - all at the touch of a button. Choosing the big green &apos;Just create the link&apos; button will do exactly that, it will create a link, using any options selected on the initial share link window, that you can then copy and paste to wherever. This link will have unguessable security, so although no one would be able to guess the link, if the link is passed onto someone, they would be able to view the content. If you have created a link in error or want to check the links details, you can get additional info and expire any links in the &apos;Share link&apos; page on your black menu sidebar. For more info on that see here.